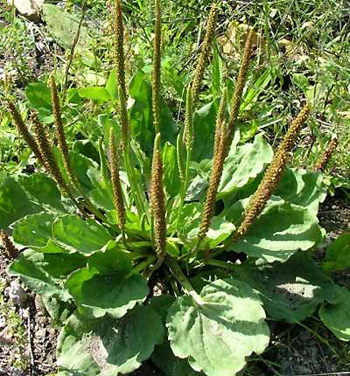 Lance-leaf plantain is a perennial plant; the erect, long-stalked, lanceolate, well-defined veined leaves, each up to 8 inches long, grow from the rootstock on margined petioles in a basal rosette. Several grooved flower stalks may grow from 6-30 inches high, tipped by a short spike of tiny white flowers whose brownish sepals and bracts give the spike its predominantly dark color. Flowering time is from April to November. Fruiting spike has many small, hard fruits. Other varieties: Common plantain (P. major), pale indian plantain (Cacalia atriplicifolia), and gray ribwort (P. media). A very common weed inhabits bear trodden ground in waste places, backyards, along tracks, meadows, roadsides, agricultural lands, and dooryards in the eastern and Pacific coastal states of the United States, and in Canada and Europe. Native of Europe. Grows practically all over the United States. Tradition maintains that English plantain springs up wherever English people set foot, no matter what the climate. The botanical name is derived from the word “planta,” a foot, and “ago” a wort (meaning plant) in allusion to the shape of the broad leaves as they lay on the ground. There are 2 kinds of plantain, narrow and wide leaf. Both are good and the whole plant is used in either case. The Smoky Valley Shoshones made a tea from the whole plant and used as poultices for battle wounds and bruises. Old timers used to kill spiders with plantain tea sprinkled on their webs and around the rooms. In China, the common plantain (P. major) is a pest. The seeds were eaten, with a sweetish, cooling taste. Useful remedy for cough irritations and hoarseness and for gastritis and enteritis. Good for all respiratory problems, bronchitis, asthma, especially those involving mucous congestion. Used for diarrhea, nosebleed, kidney and bladder trouble, jaundice, headache, infections, hepatitis, spermatorrhea, loss of sexual power, promotes fertility, bedwetting, sciatica, tuberculosis, syphilis, snakebites, worms, toothache, dropsy, prevent blood poisoning, excessive menses, and inflamed eyes. A decoction of the dried leaves promotes the coagulation of blood. The fresh juice, pressed from the whole plant, is helpful for chronic catarrhal problems, hay fever, allergic rhinitis, gastro-intestinal ailments, and worms. Externally, the fresh leaves are crushed for application to erysipelas, eczema, burns, ringworms, tetters, shingles, scalds, wounds, running sores, ulcers, cuts, scratches, boils, tumors, insect bites even hemorrhoids. Widely used as a laxative, and combats inflammation. If stung by insects, immediately rub some crushed English plantain leaves into the area around the sites of the stings, this will prevent swelling and itching. English plantain grows everywhere and is easily spotted. Infusion: steep 1 tbsp. leaves in 1/2 cup water for 5 minutes. Take 1 cup a day. Decoction: boil 2 oz. dried leaves in 1/2 qt. water. Helps coagulate blood. Juice: take 1 tbsp. in water or milk or mixed with 1 tbsp. honey, 3 times a day. Ointment: for hemorrhoids, boil 2 oz. of the plant in 1 pint soybean or peanut oil.